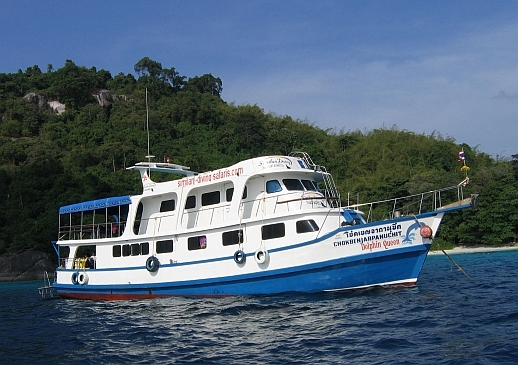 Our Myanmar liveaboard is the MV Dolphin Queen, an established liveaboard that provides comfort, safety and great food while exploring Myanmar’s underwater world. The Dolphin Queen has 3 decks – Sundeck, Upper Deck and Main Deck. 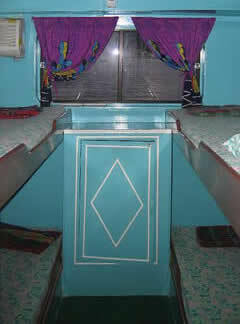 All cabins are air conditioned and have a sea view window. 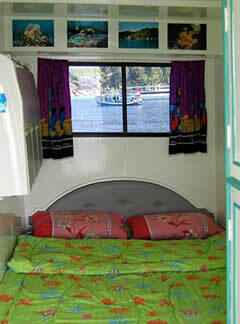 There are 2 Upper Deck cabins with double beds – when you open the cabin door the view is the ocean and islands. The main deck has 2 double bed cabins, 1 twin bunk bed cabin, and three 4 Bunk bed cabins. The four bunk cabins are fitted with curtains for each bunk bed for your privacy. All cabins have 220v plugs, so you can charge your battery packs or your lights. None of the cabins are ensuite – there are 3 spacious shower rooms with toilets on the main deck and two additional showers on the dive deck. At the back of the Upper Deck is the dining area. Here you can help yourself to coffee, tea, toast, water, electrolyte drinks, fruits at any time of the night or day – these items are always on the table for your convenience. The dining area consists of 1 large table in the center and 2 additional tables on the side ample room for dining the sides of the boat are open so you can enjoy the good weather to the maximum. Our food is very popular with our guests – there’s always enough to go around and several dishes delivered at both lunch and dinner so you can try a wide variety of different tastes. We provide a mixture of Thai and Western dishes and our chef can also cater to vegetarians and other special diets – just tell us your needs when you send your enquiry. Breakfast is European style: we serve brown bread, omelettes, fried eggs, sausages, corn flakes, muesli, fruits, and fresh ground coffee or Nescafe. Lunch and dinner are served with traditional Thai food, although the chef can prepare a Western dish if you really don’t care for Thai food. We also have a TV and DVD player so any videos made on the trip can be reviewed, or relax and watch a movie. There is also a stereo so you can relax with some of your favourite CDs. Don’t forget your MP3 player you can connect it to our stereo. On the main deck at the stern is the Dive Platform and gearing up area. This is where you get ready for each dive – there’s plenty of room to put on and store your dive gear. Close at hand are the boat crew, who are there to help you gear up and help you on your dive entry and exit. The crew will fill the tanks so all you do is dive. Most of the time you will be picked up by our boat or our dingy. We also have 40 Luxfer 12 ltr Tanks. We use INT connection and we have DIN adapters. At the top of the Dolphin Queen is the sundeck. There is plenty of room for getting your tan. We also have a couple of hammocks & sundeck chairs under the shaded area on the back of the sun deck, This is a nice place for spotting Dolphins, Manta rays and Whale sharks while travelling to new dive sites and up here your always the one to spot the Dolphins first. Traditional Thai Massage is available on the boat by request. Massage is a great way to relax after diving – the massage takes place up on the sundeck, usually at sunset or early evening.